Implantation bleeding, occurring during the second half of your menstrual cycle, is usually of short duration. For a few women, it might continue longer, lasting even up to the time of the next expected period. Know what to look out for and when to consult your doctor to rule out other problems. For most women, implantation bleeding lasts about 24 to 48 hours. The duration of this minor cause of bleeding in the early first trimester of pregnancy is variable, so don't be surprised if yours last longer. Your bleeding could last up to the six or seven days of implantation and therefore up to the when you expect your next period. This means if your menstrual cycle is the average 28 days long, your implantation bleeding could occur anywhere between day 20 or 21 up and days 26 to 28. The bleeding may occur on and off. Usually the bleeding is much lighter than a period, and you might notice only one spot of blood or other brief spotting or staining on your underwear or toilet tissue. Rarely, if ever, would the bleeding be heavy. The blood mostly ranges from light pink to dark brown and might sometimes be mixed with tiny clots or mucus. You might also have minor, short-lived pelvic cramps. Implantation bleeding does not occur in all women, and each person can experience different characteristics. Some women might mistake the bleeding for their period, and others barely notice the scant spotting. The lining of your uterus (the endometrium) develops each cycle to accept and nurture an embryo. Numerous small blood vessels supply the tissue of the endometrium. During implantation, bleeding can occur when the embryo disrupts the endometrium and these vessels that will supply blood and nutrients to the early pregnancy. A fertilized egg travels from the fallopian tube and reaches the uterus by about three to four days after fertilization. According to the 2009 GLOWN review cited above, implantation begins about three days later. 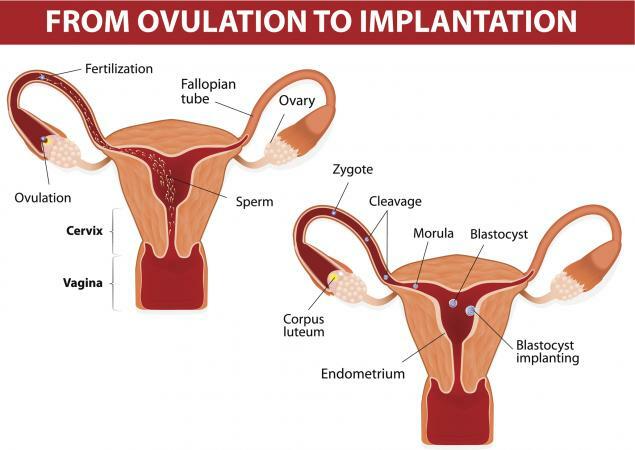 The process of implantation establishes a connection between the developing embryo and the mother's circulation that will last until delivery of the baby. It is especially important to talk with your doctor if you have significant pelvic cramps or pain with any type of bleeding pattern, even if you don't have symptoms or signs of pregnancy. Implantation bleeding is usually of short duration and is part of the normal process of establishing a pregnancy when the embryo arrives in the uterus. If you notice this type of bleeding, do a home pregnancy test and talk with your doctor about the next steps to take to ensure you have a healthy pregnancy and enroll in prenatal care.